New overnight oats recipe for you guys today. 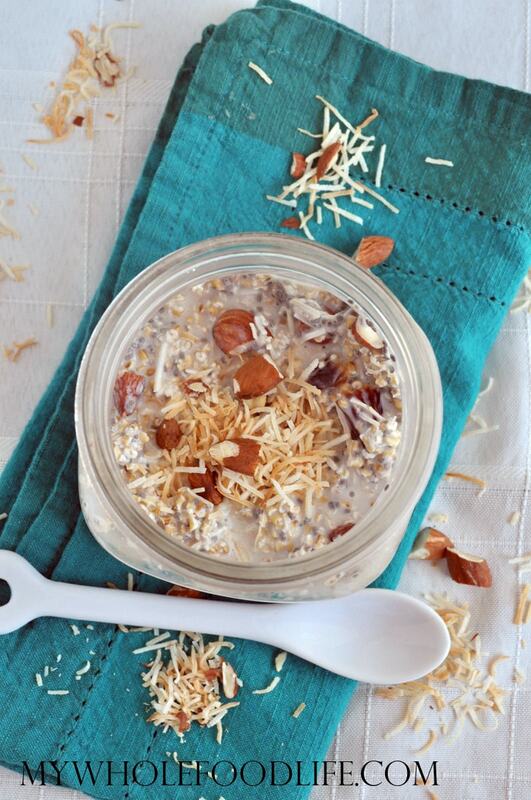 This time it’s Toasted Coconut Overnight Oats. If you haven’t tried overnight oats before, I suggest you try. They are seriously life changing. You can make up a week’s worth at a time for easy and healthy breakfasts all week. Since they come in a jar, they are easy for you to take to work as well. I love the combination of the toasted coconut and the almonds. I used steel cut oats in my recipe because I like the crunch that retains. If you like a smoother oatmeal, you can use rolled oats. These can be eaten hot or cold. Whichever you prefer. I like mine cold because they remind me of cereal. The toasted coconut really makes the flavors pop in this easy breakfast recipe! Preheat the oven to 350. Measure out 1/4 cup shredded coconut and place on a lined baking sheet. Bake for 5 minutes. ]. Mix well, cover and place in the fridge overnight. In the morning, you can heat them up or eat them cold. If the mixture looks a little dry, you can always add a little extra milk. Enjoy! Which is your favorite overnight oats recipe? You are so welcome! I hope you enjoy it. I think I will use ground flax instead of chia. That should be fine too. I notice you use a lot of almonds in your recipes. I am deathly allergic to them. the recipes look so good. :( what could i use as a substitue?? I was wondering if you cook the steel oats first? Nope! They just need an overnight soak. :) You can heat them up in the morning if you prefer to eat them warm. These look yummy!!!!!! I can't wait to have a go at these!!!! !